I remember visiting a record store in Stockholm back in 1993, grunge had taken over and melodic rock, metal and AOR was breathing its last sighs. Out of the speakers came a sound that sounded like something from the late 80’s or early 90’s and being a music nerd that followed melodic hard rock slavish, I knew this had to be something new because I couldn’t for the world figure out who this lot were. The song in question was “Saviours Never Cry”, the band was Harem Scarem from Canada and the album was called Mood Swings and it had just arrived to the music store the day before. Luckily for me and my likes, the owner of the record store was a complete music nerd that made me look like a musical retard, that refused to give up on hard rock and metal just because flannels, goatees and heroin addiction were hip. He did sell grunge as well, though, hard rock in all shapes and forms was welcomed. Unfortunately he went out of business a few years later. Anyway, I didn’t even have to listen to the whole song, I just bought the record on the spot because I KNEW this would be a great album. And I was right. It was a killer album, full of catchy melodies, addictive choruses, great musicians and a melodic but heavy sound scape. I had found my new favourite band. Or so I thought. Things changed already by the follow-up, 1995’s Voice Of Reason, an album clearly influenced by grunge both sonically and visually. I don’t hate the record, but I’m not that big about it either. Needless to say, Harem Scarem never became my favourite band. After that, Harem Scarem lost a lot of the grunge influence and I checked out their records every now and then (Big Bang Theory (1998), Rubber (1999), Weight Of The World (2002) and Overload (2005)), but none of them gave me the same feeling as Mood Swings did back then. Good records, yes, but never great. It kind of says something when I have only heard five of their 13 records (well, it’s 14 if you count the new recording of Mood Swings last year), the band just haven’t interested me enough. Maybe I have missed something, I dunno. To be honest, it was the fact that they re-recorded Mood Swings that made me bother with this album. That and the Frontiers Records project First Signal, that singer Harry Hess sang on. Those two happenings made me hope that Harem Scarem had found their way back to do what they do best – play melodic hard rock. Sure, most of their albums has been melodic hard rock, but the quality of the songs never made it past good and with an album like Mood Swings in their back catalogue, you know what the band (read: song writers Harry Hess and Pete Lesperance (guitar)) are capable of and therefore that is the album I compare everything they release to. Unfair maybe, but that’s the way I see it. But opener “Garden Of Eden” sets the record straight right away. It’s a great heavy melodic hard rock song with an instant catchy chorus that sounds like it could have come right off of Mood Swings. “Live It” keeps the melodic rock fest going, a great rock ‘n’ roll song with a big hit feel. “The Midnight Hours” has a hook that leaves you defenseless and sounds like the classic Harem Scarem that I love. Yours truly is a real sucker for a well-written, big power ballad and with “Whatever It Takes”, I get exactly that. This could and should have been a hit back in the day. With “Saints And Sinners” they choose the harder path, but it still has Harem Scarem and catchiness written all over it and “All I Need” is a brilliant little pop song that sounds like U2 meets Def Leppard with all the Harem Scarem signatures shoved in there. “Troubled Times” is another one that could have been straight off Mood Swings with its heavy AOR sound. “Never Say Never” is slow and a bit mellow, but I wouldn’t call it a ballad even though it is on the softer side. Great song, no matter what you call it. The album’s closer is called “Stardust”, a slow rocker with a killer chorus that reminds me some of the First Signal album that Harry Hess sang on. Brilliant! As I wrote earlier, I haven’t heard all of Harem Scarem’s albums, but it only took one listen for me to build an opinion that this is easily Harem Scarem’s best album since Mood Swings. It has all the elements of a great melodic hard rock / AOR album should have and this really should have been the natural follow-up to Mood Swings. Looking back at Harem Scarem’s career, I can’t help getting the feeling that they could have been a really big band by now had they played their cards right because they always had a sound of their own, mostly in their melodies and even when the band made a wrong turn and went down roads that only lead to a confused sounding band you could hear that it was Harem Scarem. Now, I’m not a promoter of recording the same album over and over – nope, but it is important to make sure that you move in the musical circles where you created your fan base in the first place – and more so, make sure that the quality is more important the quantity. 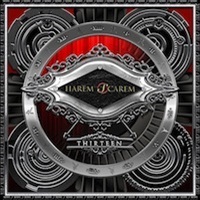 Anyway, this new album proves that the guys are back for real with an album that stands for high quality rock songs and a style that is all Harem Scarem. This album is a must for every Harem Scarem fan out there and for every fan of melodic hard rock and AOR as well. This is what I call a real come back! Great writeup! I have almost all their albums. I’m missing a couple of the newer ones like Hope. And this one. I agree totally about Mood Swings and the follow up. Wow, I was so disappointed. The third album is nothing on Monday Swings. Anything else by them you think I should check out? Anything you recommend? Yes, I think their first album isn’t bad but it’s a bit light. The fourth album, which I think was called Karma Cleansing, was very much an attempt to get back to their older sound, while still moving forward…I think it’s a great album. I also like the following album, Big Bang Theory, although it starts to stray off a little bit into the pop-punk territory. I will check those out a.s.a.p. The Big Bang Theory left me a bit underwhelmed though. I first “discovered” Harem Scarem when their Human Nature album came out. I listened to it nonstop for months. I still enjoy when one of the songs from that album pops up in my playlist. I’m like you Jon I got two copies of Mood Swings! Hahaha…one from 93 and the re record from 013! Due to your review I’m gonna check this one out for sure! I haven’t heard the re recording of Mood Swings. Does it differ much from the original? I’m not sure if I need to get a copy of that. Are the bonus tracks good enough for a purchase? Yes the bonus tracks are good songs. Actually the rerecord is really good …. I have both versions of Mood Swings and love them both for different reasons. The new version is a bit heavier and thicker sounding. This works great on most of the songs but on a few songs the guitar tones from the original seem to fit the song better…but I grew up in the 80s. The new version of “Just like I planned” is so much better as well…more emotional and timeless than the original one, which to me seemed cliche and forced. The bonus tracks are awesome. The songs are a bit more modern than the Mood Swings tracks, but then again several decades have transpired between songwriting so it’s expected they will sound different. The bonus tracks actually make a great segue to the songs on “Thirteen”. I really like “Thirteen” as well. I’m still listening to it as the songs randomly come up in my player. I like to listen to new music this way rather than the entire album front to back…it lets me hear how the songs sit in my entire collection. I can safely say Harem Scarem songs not only hold their own against anything I have, but I never get tired of listening to them no matter how many times I hear them. Wow, cool Jeff. I guess I better get my hands on Mood Swings II then. Thanks for taking the time and write a few words and thanks a lot for stopping by here. Glad to give you some insight on Mood Swings II. I’ve known Pete Lesperance for 5 or 6 years now and am a big fan of his work, including Harem Scarem, Fair Ground and his solo stuff. He and Harry are both really cool guys and have so much talent it’s ridiculous. I hope they keep putting out new music because they just keep getting better…and let’s face it…most music that’s out there today is hard to listen to! I just listened to their debut album. Always thought that Mood Swings was their debut. Very good album indeed.